I had a lot of time today, so i decided to scrap my pics. Actually it took me about weeeeee 3 or 4 hours?? 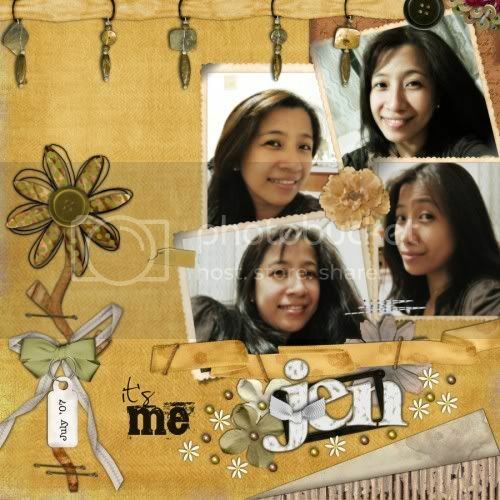 making this layout..yayyy bec. i was not satisfied with my 1st layout so i keep on removing the elements and move the pic from here to there. Then finally this is the outcome and i liked this one better. Sometimes i don't know really where to start, i just envy those seasoned scrappers. Anyway this is my work. uy, todo posing si ate jen. *LOL* nanggugulo lang. ganda ng LO! tagal ko na di nakapagscrap!